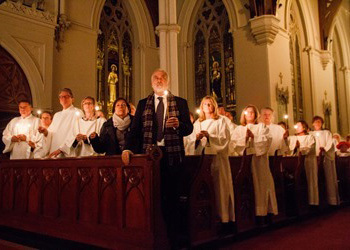 Although Holy Saturday is the last day of the Sacred Triduum, it was the first target of the reformers’ aim to change the entire Holy Week liturgy. Initially, they pretended that it was only a question of changing the time of the ceremony from morning to night. (1) But we now know for certain that what was being planned by Bugnini and the Papal Commission in 1948 was far more disruptive of Tradition and takes us onto quite a different plane. Whereas the other ceremonies of Holy Week were only partially affected by cuts and innovations, the Easter Vigil, as we shall see, was totally dismembered, its remaining parts arbitrarily rearranged and altered to change its symbolic meaning from a Christ-centred to a man-centred celebration. 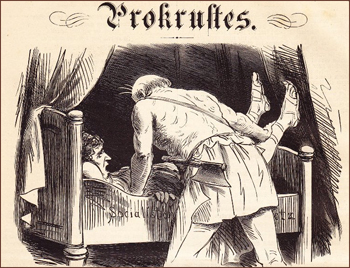 To illustrate the point by way of analogy, let us recall the story from Greek mythology about Procrustes, a rogue innkeeper and robber from Attica who had a bed that he claimed would fit anyone, no matter how tall or short the person would be. And he was right – he forced his guests to fit the size of the bed by cutting off their legs or stretching their bodies into the required shape, before robbing them of their valuables. The analogy can be aptly applied to the new Easter Vigil, which Pius XII presented to the Church as a fait accompli in 1956 when it became obvious that the entire rite had been hacked and racked on a Procrustean bed of reform, with many of its precious assets stolen. The reformers chose “active participation” as the bed on which the traditional rite was to be measured, and decided that whatever parts of it did not conform to their ideals should be hacked off or twisted beyond recognition. Now, we will examine the 1948 “Memo” to see what in that text was used to justify the creation of a new rite. Chapter 3 reveals the fundamental bias of the Commission against the traditional Easter Vigil, how it was put on trial and accused under false pretences of being unfit for purpose. Fr. Ferdinando Antonelli mentioned some “problems” with the traditional Easter Vigil as a whole which, he considered, stood in need of reform. To begin with, he considered the centuries-old tradition of holding the Vigil in the morning as an aberration from the practice of the early Christians who held it at night, and recommended a return to antiquity. But all these points, far from constituting evidence for a reform, simply reflected the views that were characteristic of the leaders of the Liturgical Movement. As we have seen, these views had already been doing the rounds in the German-speaking lands in the 1930s and 1940s when some progressivists such as Frs. Pius Parsch, Romano Guardini and Hans Reinhold were conducting their own experiments with the Easter Vigil in defiance of Canon Law. In fact, there is reason to believe that what Fr. 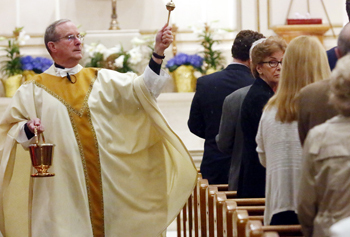 Antonelli wrote in the “Memo” about the presumed need to reform the Easter Vigil was merely the expression of his own personal opinions coupled with those of other activists for liturgical reform. The fine details of this reform were left to be hammered out by a sub-commission – in secret – and later approved by Pius XII. Before proceeding further, we must note that the “many people” were the few key progressivist reformers, mainly from Germany and France, supported by a band of zealous flag-wavers and that there was certainly no popular demand among the clergy or laity for a reform of the Easter Vigil. Thus, he introduced two concepts that were foreign to the Church’s discipline: that innovation was a praiseworthy and integral part of liturgical development, and that new rites that had no precedent in liturgical history can be invented if deemed by “courageous men” – including himself (5) – to be good for the people. From that moment, the official organs of the Holy See embarked on a course of liturgical adventurism that would lead eventually to the most incongruous innovation of all: Pope Paul’s New Mass. It was only in the estimation of the reformers that their innovations were considered “good.” And the “new forms” envisaged by them came not from “forms already existing” in Tradition, but from those conceived and enacted by the reformers outside Tradition, which had no right to existence in the first place. Unfortunately, Pius XII incorporated some of these into the Church’s official liturgy. Suddenly the destroyers of Tradition who had been ignoring or deliberately flouting the rubrics and rebelling against authority were transformed into heroes of the Church. Received forms of worship that had been the mainstay of the spiritual life of the faithful for centuries and were instrumental in the formation of countless saints were deemed useless and cast aside by the “courageous” actions of the progressivist reformers. But, anyone truly courageous enough to put his head above the parapet and oppose these reforms was immediately shot down in flames and subjected to a campaign of bullying, intimidation and personal abuse by members of the Liturgical Movement. In the next section, we will deal with the 1956 reform of the Easter Vigil. It will become clear that Antonelli and his companions were acting not from the moral virtue of courage, that is, to save the traditional Vigil and prevent it from coming to harm, but rather from their own narrow, one-sided and self-serving desire to destroy it. The three aforementioned “expert” Consultors of the Commission were all in favour of holding the Vigil at night , with Capelle being the most adamant about it. Memoria Sulla Riforma Liturgica: Supplement II, pp. 21-22. Ferdinando Antonelli, Memoria, n. 75. In fact, Fr. Antonelli once boasted of his self-styled “courage” to Pius XII during an audience when he presented his “Memo” to the Pope. In his diary, dated July 22, 1949, he said that the Pope, having read some of the “Memo”, described the proposals for reform as “valientes” (courageous). And Antonelli replied that his “courage” was based on his confidence that he could count on the Pope’s support. As it turned out, his confidence was rewarded by Pius XII in the Holy Week reform. Apud Nicola Giampietro, El cardenal Ferdinando Antonelli y la reforma litúrgica, Ediciones Cristiandad, 2005, p. 42, note 30.